It's the controller inside that counts, and you'd be surprised at how some are implemented. 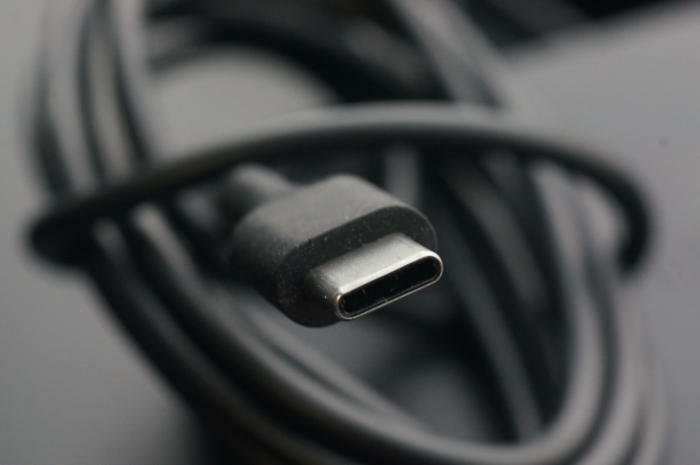 USB Type C is supposed to be a universal standard, but it’s just universally confusing. A USB Type C port can run at either 5Gbps or 10Gbps and still be labeled USB 3.1 by the laptop maker. USB Type C even technically supports USB 2.0 speeds at a pathetic 480Mbps. So when you see a USB Type C port, the only assumption you can make is that its transfer speeds can vary from as low as 480Mbps to as high as 10Gbps. To muddy things even further, Intel’s Thunderbolt 3 technology uses the same USB Type C port for transfers over PCIe. It'll also support USB 3.1's 10Gbps. There’s a longer discussion to be had about Thunderbolt 3 and video-out support over USB Type C, but that’s for another day. I did, however, write about Power Delivery and not-so-universal charging on USB C (hint, it’s a bit of a mess). Not all USB Type C ports are created equal. A few key factors impact performance over USB Type C. Obviously, the first is your PC’s source drive. If you’re copying from an internal hard drive, for example, you won’t get near the speed of the port, because most drive interfaces can't match USB Type C's top speed. The other major factor is the controller chip that’s used for the port. There seem to be two popular chips on the market today. The first is ASmedia’s ASM1142. It’s a USB 3.1, 10Gbps chip found in a lot of the early laptops and desktops that implemented USB-C. I didn’t have a laptop with the controller, so I threw an Atech BlackB1rd MX1 PCIe card with the controller into a desktop system. The performance should be pretty much the same as you’d get out of a laptop. Intel’s pricey Thunderbolt 3 chip, which includes USB 10Gbps capabilities, is another candidate. The last option you’ll find in many laptops is the USB 3.0 controller built into the Intel core logic chipset. This same chip controls the standard USB 3.0 Type A square ports. Many PC makers simply plumb this signal into the oval USB Type C connector. This is actually the most common solution because it’s cheaper and doesn’t consume more power. 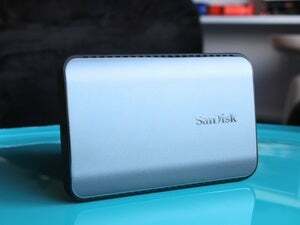 However, its presence also means that any USB 3.1 Type C port is stuck at USB 3.0's maximum speed of 5Gbps. The Sandisk Extreme 900 drive is among the first true USB 3.1 10Gbps drives we’ve seen. 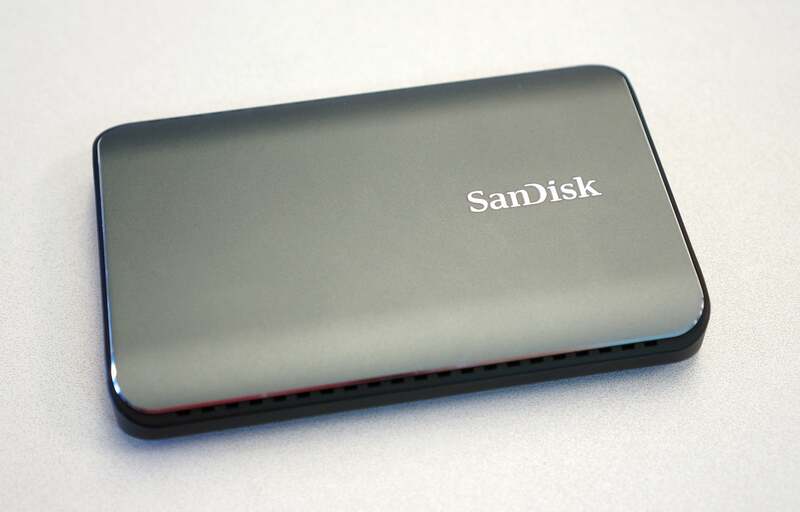 For our test, I used Sandisk’s Extreme 900 SSD, which supports USB Type C at 10Gbps speeds. Sandisk builds this 2TB drive by wiring two M.2 SSDs in RAID 0 internally. It’s pretty blistering fast for a USB drive. Plugging into each laptop’s USB Type C port, I then ran the AS SSD storage benchmark for pure sequential transfer speed across the port. The results speak for themselves in the benchmark chart below, ranked from highest- to lowest-performing. Each entry lists the laptop make and model along with the USB controller. We graded more than half a dozen laptops based on their USB Type C performance. No surprise, the laptop makers that resorted to the lowest-cost option (wiring the included Intel USB 3.0 5Gbps controller to the USB Type C port) give you, well, 5Gbps performance. I didn’t test a 12-inch MacBook because AS SSD doesn’t run in OS X, but it uses the same controller, so expect it to be similar to the others here. Of greater interest is the performance of the 10Gbps chips: the ASMedia chip and the Thunderbolt 3. In the chart, that’s represented by the two Dell XPS laptops for Thunderbolt and the ASMedia chip in the desktop. In these tests, the ASmedia has a slight edge on the Thunderbolt 3 controller. Vendors have told me their own internal testing backs that up. The Samsung Notebook 9 Pro appears to use just the USB 3.1 portion of an Intel Thunderbolt 3 controller. 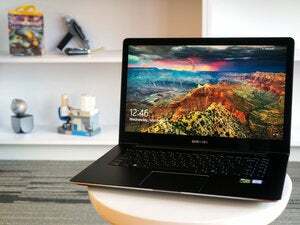 There’s one more rather interesting wildcard in the test, and that’s the Samsung Notebook 9 Pro laptop. This 15.6-inch laptop takes a rather unusual approach with its USB Type C port by integrating an Intel “Alpine Ridge” Thunderbolt 3 chip, but opting to use only the USB support in it. 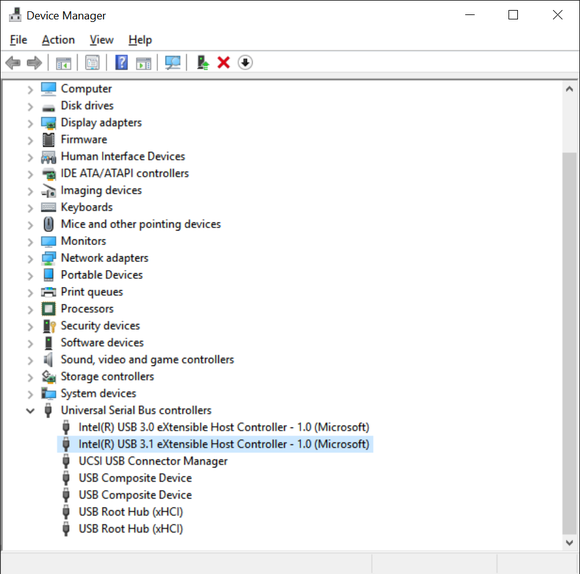 In the device manager, it even shows up as an Intel USB 3.1 controller as you can see from the screen shot above. Samsung officials confirmed the laptop doesn’t support Thunderbolt 3. I even tested it with an Akitio Thunderbolt 3 drive to confirm. Why Samsung did this I just don’t know. I do know that the performance was oddly slower. It was faster than the plain-jane USB Type C port that uses the Intel chip, but slower than the ASMedia and full Thunderbolt 3 laptops. Weird. 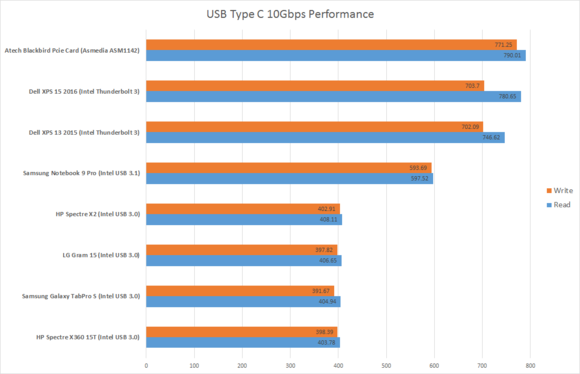 One look at the benchmark chart should tell you that there are real hard benefits to having a full USB 3.1 10Gbps port in a laptop or desktop PC. The most obvious is the time saved waiting for files to copy to your USB drive. The other is taking full advantage of that great new USB 3.1 10Gbps drive you just bought. 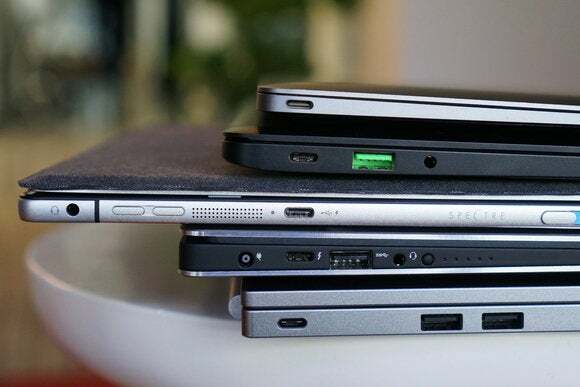 As USB Type C ports start appearing on more machines, it'll pay to read the fine print in the specs.